Asimmetric's founding team in Highway1's San Francisco office. 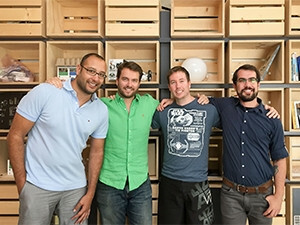 Left to right: Fouad Zreik, David Wilson, Ross Douglas, and Michael Champanis. Cape Town-based start-up, Asimmetric, has become the first South African company to join San Francisco hardware accelerator programme, Highway1. This comes amid a flurry of activity in the local start-up space. Last month, South African home-cleaning service, SweepSouth, was selected by Silicon Valley venture capital fund and start-up accelerator, 500 Startups. Speaking to ITWeb yesterday, David Wilson, co-founder and CEO of Asimmetric, said the start-up company is paving the road to a better, more reliable Internet. "We help WiFi operators, network carriers, Internet service providers, hotels, airports and hospitals improve their networks' quality of experience for users. "We do this using our proprietary network sensor, called a Bot, and analytics. Our solution helps to detect service issues proactively, troubleshoot sites remotely, and measure what really matters - users' quality of experience. This reduces site visits and other operating costs, and improves service quality and monetisation." Highway1 is a division of PCH, a custom product solution company for start-ups and Fortune 500 companies. It involves an intensive 16-week programme where hardware start-ups work directly with a dedicated team of engineers and other professionals to improve their hardware, operations and sales. Asimmetric is at Highway1 to produce the next generation of its hardware - a network sensor used to test Internet quality for WiFi providers and mobile operators. The start-up received a $50 000 cash investment from the accelerator, and last year it raised funds from angel investors but has not disclosed the exact amount publicly. "The majority of the value of the programme for us comes from our exposure to some of the top minds in the world, based in Silicon Valley and San Francisco. "We are using our time at Highway1 to refine our product and conduct trials with new clients. We hope to have some announcements on this front during the coming months," Wilson said. The programme also includes access to experienced mentors, opportunities to pitch to venture capitalists, and a trip to China to meet and work with manufacturers. Co-founder Ross Douglas, who has just returned from the trip to China, says: "It was valuable to meet with suppliers and to see the most advanced factories in the world. We will bring what we have learned back to our partners in South Africa, as we continue to manufacture most of our hardware in Cape Town." "This would be a fantastic opportunity for any company, but for a Cape Town-based start-up with humble beginnings, it is extraordinary," added Wilson. "San Francisco is the centre of the tech universe. We've met some of our tech heroes. We've met with some giant tech firms that are household names. We are incredibly fortunate and are working around the clock to make the most of this rare opportunity. We're excited by how everything we are learning and doing is going to help us serve our clients better." He revealed Asimmetric, which was founded in 2013, also now has offices in San Francisco, and is hiring top network and software engineers who are passionate about making the Internet better. Asimmetric is one of 13 companies selected out of more than 350 that applied to participate in the programme this autumn. Fifty-eight start-ups have participated in the programme to date, including hardware companies Drop, Ringly, Podo and Cue. Alumni have raised more than $61 million in funding.